I have long been interested in our relationship to the otherworld, our myths and stories, and those things seen just out of the corner of your eye. 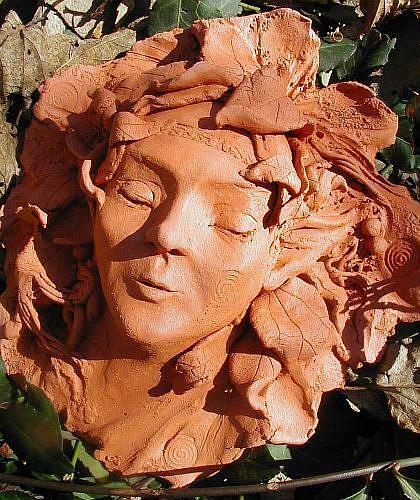 Most of my green man sculptures grow out of that fascination--they're generally more abstract than this. This is an original sculpture, created last year for my show at the Green Man Review, in their now defunct Arthur Rackham Gallery. 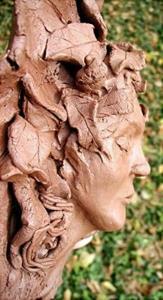 The show is now up on my own page, in my Greenman Gallery at http://cathyjohnson.info/gallery/index.html. 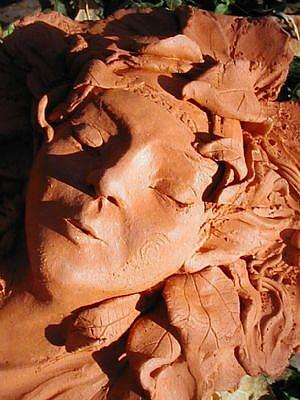 I find sculpture very exciting and very much of a challenge--terra cotta is delicious to work with. 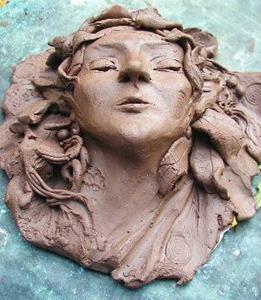 This one I began as a humanesque sculpture and then added leaves, a snail shell, and those ears in order to suggest her otherworldliness.